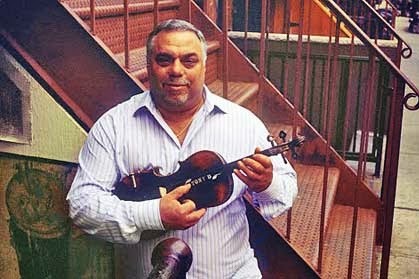 If you spend any amount of time around fiddler Tony DeMarco, you know he is a true-blue New Yawker fiercely proud of his Brooklyn roots and also his Italian and Irish heritage. In becoming one of the pre-eminent fiddlers in the New York-Sligo style of music, he learned from the very best and has kept that music alive through his prodigious session work around town. The well-traveled musician has also noted a great void in New York City in hosting a respected traditional music festival since the days of the Irish Arts Center’s Snug Harbor Series that died out in the early 1990s when funding and leadership eroded. Determined to highlight the great music tradition and musicians making their homes around the Big Apple, DeMarco set about changing that and the first annual New York Trad Fest was born and takes place place this past weekend around town in various venues. By festival standards it is a modest beginning inspired by session-driven events like the Ennis Trad Festival, which relies on a series of “Session Trail” fixtures anchored by local musicians in abundance around Clare which also suits DeMarco’s plan of attack in New York. The weekend begins in an academic vein with Dr. Mick Moloney – who has just been named as a recipient of a 2013 Presidential Distinguished Service Award for the Irish Abroad by Irish President Michael D. Higgins – moderating a discussion panel. Moloney has dedicated 40 years in America to the study and advancement of Irish music over here. He tackles the topic of “Masters of Irish Traditional Music and Dance in New York in the 20th Century” with Jerry O’Sullivan, Brian Holleran, DeMarco and Siobhan Butler. That took place at Glucksman Ireland House on Saturday from 1 to 3pm. The weekend moves into action mode a little further uptown at the weekly Saturday Lillie’s session in Union Square from 4-7 p.m. (17th Street between Fifth Avenue and Broadway). The moveable feast transitions to Times Square and Connolly’s Klub 45 on the third floor (121 West 45th Street) from 7 p.m. to midnight featuring up to 30 musicians in various combinations. Slated to appear are Brian Conway and Brendan Dolan, Eileen Ivers and Greg Anderson, Kenny Kosek, Tony Trischka and Andy Statman, Moloney, Allan Kaufman and Mark Horowitz, James Keane, John Nolan, Jerry O’Sullivan, Ivan Goff, Cillian Vallely, Joanie Madden, Anna Colliton, Matty Mancuso, DeMarco, Allan Murray, Donnie Carroll, Dan Gurney, Dylan Foley and a new generation of New York trad players, Jayne and Bram Pomplas and Maeve Flanagan. Stepdancers Donny Golden, Kieran Jordan, Megan Downes and Siobhan Butler will provide some percussive panache. Many of these musicians will also be appearing at two regular Sunday sessions in Manhattan on the West Side and the Lower East Side allowing time to sample the different neighborhoods. From 5-8 p.m. near the foot of the High Line Park the Brass Monkey (55 Little West 12th Street) is the place to mingle amidst the music and musicians assigned there. There is a two hour break allowing for a leisurely supper somewhere between the West Side and the East Side for the late session at the 11th Street Bar (510 East 11th Street) normally anchored by DeMarco and known as the go-to place in New York on Sunday night to the wee small hours. These kinds of festivals usually have their own surprises and last minute scheduling changes, but it looks very exciting for the maiden voyage for DeMarco and crew. You can visit www.newyorktradfest.org for more info and to purchase tickets via PayPal which is recommended for the Saturday concert because space is limited.